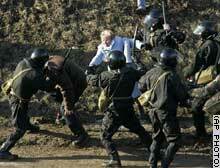 Belarus protests and crackdown continue; see BR23 for more details. Ukrainian ruling reform party loses at the polls; Yukaschenko might not be prime minister much longer. Veronica Khokhlova discusses. Does the CNN Minsk photo to the right look like some sort of Hitleresque video game? "Aryan Rampage" or something? Could you please pick on more helpless looking pro-democracy demonstrators, and dress in more storm-troopery garb? The good guys aren't quite obvious enough.